As our kids get older, we are planning trips around their interests and getting them more involved in the travel planning process. Our 10 year old daughter had spent the last two years reading her way through everything that the children/young adult’s author, Rick Riordan had written. She devoured his stories based on the fictional character Percy Jackson and her knowledge and interest in Greek mythology blossomed. When I found cheap flights from Asia to Athens on Scoot Airlines, I knew she would be absolutely thrilled. This was part of our 2-month summer travels and we would be hitting Greece in August: peak season with peak prices. I knew this would be a challenge for us budget travelers, but I was up for the challenge. While there are many companies that offer single or multi-day Percy Jackson themed tours, we planning a self-drive itinerary visiting the major locations in the Percy Jackson books. 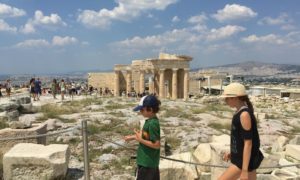 Our DIY Percy Jackson tour was 10 days where we visited Athens and drove through the Peloponnese with our 3 kids, ages 7-10. 1 Who is Percy Jackson? 8.0.1 Enjoyed Reading this Post? SIGN UP for more. Percy Jackson is the central character in a series of fantasy adventure tween books written by Rick Riordan. Best suited for kids 9-13+, every kid that reads these books seems to love them. The first series is Percy Jackson and the Olympians, where he goes on a quest to defeat the mythological Greek villains. Through these engaging stories, kids are introduced to the Greek gods as Riordan weaves mythology with fiction. Greece is a wonderful destination to visit with kids. Overflowing with history, a rich culture, warm hospitality, delicious food and affordable prices, it is a great place to visit with kids of any age. The Percy Jackson books hooked our daughter and made her want to see the places she had read about. Our boys had not read the books but were still interested in Greek history and the archaeological sites. Of course we all loved the beaches, food and culture too. So many families head straight to the Greek islands, but we found the Peloponnese to be an amazing region to visit. Located just an hour west of Athens, the Peloponnese is a large peninsula connected to mainland Greece by the Isthmus of Corinth. Even in August, it wasn’t overly busy and we found ourselves mostly surrounded by holidaying Greeks and Europeans. 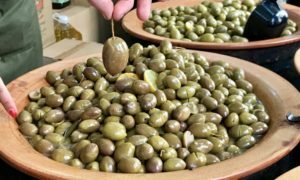 It was the major archaeological sights that brought us to the Peloponnese, but I quickly learned that there was so much more to the region. Quaint fishing villages oozing with charm, mountainous landscape, olive trees as far as the eye can see, sandy beaches and turquoise waters and the most delicious Greek food and welcoming hospitality. 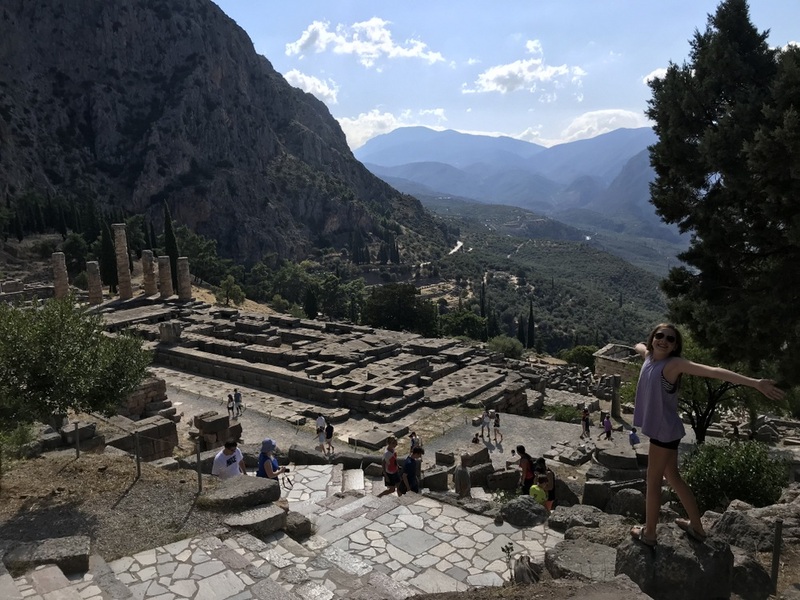 Like most visitors to Greece I probably would have been seduced by the Greek islands, but our Percy Jackson themed trip gave us the perfect excuse to visit this magical region. It is an area we will definitely return to as you could spend weeks exploring the peninsula. We had heard mixed reviews of Athens, but with major sites like the Acropolis and Parthenon, it was a must for us. We ended up loving the city and it was a great introduction to Greek culture and hospitality. 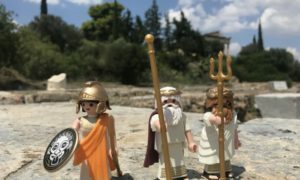 You can read our full post on visiting Athens with Kids. We stayed in a wonderfully large Airbnb apartment where we had lots of room to spread out. Our hosts greeted us with fresh fruit and snacks and hugs – welcome to Greece! The location was super close to the Acropolis Museum and other tourist sites, but still in a predominantly local area. We picked up our rental car (see below for more info on renting a car in Greece) first thing in the morning and headed towards the Corinth Canal, the entry point for the Peloponnese. The Corinth Canal is an engineering marvel that cuts through the narrow Isthmus of Corinth, making the Peloponnese an island and allowing boats to pass easily between the Aegean and the Gulf of Corinth. It is an impressively narrow canal and it was fun to stop and watch a boat go through and the brave bungee jumpers off the bridge. You can explore Ancient Corinth, a site rich in Percy Jackson lore. Between Corinth and Napflios, it is definitely worth stopping at Mycenae. While this isn’t a Percy Jackson stop, these ancient ruins date from 1600 BC. We visited on a very hot afternoon and the kids weren’t super enthused. The Lion Gate at the entrance is impressive, but much of the sites is ruins on a hilltop. It takes quite a bit of imagination to connect to the history of this UNESCO site. 12 euros/adults, children free (note that all archaeological sites in Greece advertise a charge of 6 euros/foreign child, but we were never charged for the children). There is a museum with very interesting artifacts. Audioguides are available upon request, which our kids enjoyed. We had heard people rave about the cute and charming town of Napflios and we chose this as our base for a couple of days. It is such a beautiful port city with narrow streets, Venetian houses and lots of interesting restaurants and shops. We stayed an an apartment that we booked through Airbnb with a great location in the centre of the city. There are lots of great restaurants to sit outside and enjoy a delicious meals. We had great meals at Alaloum and Aiolos Tavern. On our second day, we set about to explore the surrounding area of Nafplio. We started in town at the Palamidi Fortress, a well preserved citadel that sits overlooking Nafplio and the Argolic Gulf. You can walk from town to the Fortress, but we took the easy way and drove up. Entrance 8 euros/adults, free for children. Next we headed to nearby Epidavros, which Percy Jackson fans will remember as the Sanctuary of Asclepius (god of medicine). This was one of my favourite sights in all of Greece. The well-preserved theatre is still used to this day and the kids had a blast testing the magical acoustics of the theatre. There is a museum at this site as well and the rudimentary surgical tools were very interesting to see. Adults 12 euros, children free. The rest of our day was spent exploring the coastline and checking out the local beach culture. We stopped for lunch at Vivari where we cooled down and ate lunch a few feet from the ocean. Vivari feels like a great little local gem as we were surrounded by holidaying Greeks. We continued down the coast to Kondili Beach, a long pebbly beach with the most gorgeous clear blue waters. We rented a super fun paddleboat with slide for an hour (15 euros) and we had a blast jumping and sliding off the boat. The water was incredibly buoyant, crystal clear and the perfect temperature. When Ella was planning the Percy Jackson sites she wanted to visit, Olympia was solidly on her list. It is a little further away, but we couldn’t give up the chance to see the birthplace of the modern Olympic Games. If we had more time, I would have loved to spend a few days exploring the Moni peninsula. The drive was enjoyable as we took in the barren mountains covered with olive trees. We stopped at Kalo Nero Beach for swim and lunch. It was another great local spot. The town of Olympia exists mostly to serve the needs of the tourists that flock here to see ancient Olympia. The small town features many standard hotels and tourist shops. The terrain changes near Olympia and grew more lush, with pine forests and flowering bushes. Our first stop was Klio’s Honey Farm, something we had read about on Tripadvisor. Klio’s parents started the farm and Klio welcomed us with cool drinks as we relaxed as she explained the honey-making process. Of course we got to sample the delicious honey with some home-baked treats. We couldn’t leave without bringing some honey and honey-based products home with us. This is a lovely small-scale tourism operation. The next day we visited ancient Olympia and it was a really interesting sight to explore. You definitely want to get there early before all the tour buses roll in. There aren’t great signs at most of the archeological sites that we visited, so we relied on our Lonely Planet guidebook for explanations of what we were seeing. Hiring a guide would certainly allow you to get the most out of your visit, if it fits into your budget. It is a huge complex, but of course the main attraction is the original stadium area. The Museum is included with your ticket (12 euros/adults, children free) and is well worth a visit. Here you can learn about the ancient sports, how the athletes competed and the role of women in the Games (almost non-existent, even as spectators!). Before you leave Olympia, make sure you stop at the private Archimedes Museum established by engineer Kostas Kotsanas. He breaks down the engineering achievements of the ancient Greeks with lots of interactive exhibits for kids and adults to test out. This is a wonderfully educational and interesting small museum and best of all, it is by donation. We stayed at Hercules Hotel, a good budget option in the centre of town with family rooms. We enjoyed a nice traditional Greek meal at Symposio Taverna and had good takeaway cheap gyros (2.50 euros) in town. We were sad to be leaving the Peloponnese, as we took the impressive bridge back over to the mainland on our way to Delphi. We stopped at the very cute town of Nafpaktos for a swim, lunch and gelato. The drive from the coast up into the mountains towards Delphi was quite stunning with lots of switchbacks. We splurged on a beautiful restaurant overlooking the mountains and ocean in Delphi called Taverna To Patriko Mas. We stayed at another good budget hotel, Hotel Orfeas, with a very friendly owner. The next day we were up early to get to Delphi before the tour buses again. Delphi is one of the most important sites in Greece, due to it being the seat of the oracle. Built on the side of the mountain, the sight is incredibly beautiful and very well preserved. There is quite a bit of walking uphill. The Temple of Apollo and the Stadium were our favourite sites. The Museum has preserved freses from the Temple and Ella enjoyed identifying all the Greek gods. Entrance costs 12 euros for adults, free for children. The Temple of Poseidon can be visited in a half day trip from Athens, but we saved it for our last day with our rental car. After leaving Delphi, we stopped in Arachova for lunch. Arachova is a beautiful town set on the hillside and is a very popular point to access the ski hills in winter. The Temple of Poseidon is set on the Cape of Sounio, a popular getaway spot from Athens. The Temple dedicated to Percy’s father was on our daughter’s must-do list. While there isn’t that much to see at this site, the location makes it impressive. Entrance is 8 euros/adult, children are free. There are lots of beaches nearby to enjoy. This was our first visit to Greece and we knew the food would be good, but it still exceeded all of our expectations. The best way to eat in Greece as a family is to order a number of appetizers and dishes to share. We ate lots of the classic Greek foods like souvlaki, moussaka, meat balls, fish, tzatziki, and saganaki. As vegetarians, we had no trouble finding good veggie options like stuffed eggplant, peppers, and tomatoes. Generally there will be a bread charge of about 1 euro/person added to your bill – this is customary regardless of if you eat the bread or not. A lot of restaurants open late for dinner. Portions are huge and we ordered a few mains for the whole family to share. A carafe of house wine was a steal at 3.50 euros! We used Tripadvisor reviews to find highly rated, but reasonably priced restaurants. We really never had a bad meal in Greece and found the food to be amazing and reasonably priced. We averaged $350 CAD/day in Greece…I cringe just writing that because generally we try to spend $150/day. You could definitely save money if you traveled outside of peak season and didn’t rent a car. We spent about $100 CAD/night on budget accommodation, $95/CAD a day for the rental car plus gas and tolls, and we ate two nice meals a day totaling about $175 CAD/day. Most days we visited at least one archaeological site as well. Renting a car in Greece isn’t cheap, but a self-drive tour was still the most economical way to explore. We rented through Kosmos, a local company we had heard good things about on Tripadvisor. For our 5 day rental we paid 300 euros for a small car that suited our family of 5. We picked up our car in downtown Athens and returned it to their airport location. They were great to deal with and we would definitely recommend them. We found the roads easy to navigate. There are a lot of toll roads and some days we spent 20+ euros on tolls. I am so glad that Percy Jackson gave us an excuse to finally visit Greece. It was so fun to plan a trip around the kids’ interests and we all loved the time we spent in Greece. It was a great first taste of Greece and I know it will be somewhere we return to. With all of those islands, it will be hard to pick where to go. Dawn what a cool idea. I dug the movies. Neat feel to Greek mythology. Thanks Ryan. We haven’t even seen the movies yet – need to check them out! My son LOVES Percy Jackson. I clicked this post to browse quickly and I ended up reading everything and dreaming about taking our family on a Percy Jackson trip to Greece! Now, if we can just find a way to rent a car that seats 6…..but that will most likely be very expensive. Glad it was helpful Jill! We found car rentals so expensive in Greece, even just for tiny cars. But if you went in the off season, I am sure you could find something more reasonable that fits 6.